Mix cooking wine, soy sauce and dark soy sauce in a container for later use. Heat a non-stick pan, stir in the pork belly, pan fry under medium-low heat for about 5 minutes until browned, stir occasionally. Toss in the sugar, carefully stir to help the sugar melt, add in the ginger, star anise, bay leaves and dried chili pepper, sitr fry for about 2-3 minutes. Carefully pour in the sauce and cook for another 1-2 minutes. Move all the ingredients into a clay pot or a slow cooker, add in the hot water and simmer for about 50 minutes under medium-low heat until the sauce has almost gone. Top with the toasted white sesame seeds and serve. 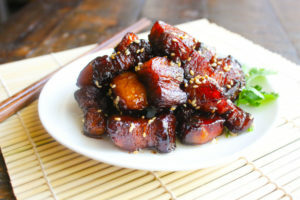 We don't need to use any oil when making this dish because there would be a lot of fat coming out from the pork belly.